Built with the animal health customer in mind, FOCUS CRM is a customer relationship management platform that offers immediate access and easy analysis for better ongoing management of sales and marketing activities. When AGDATA collects sales data on a client’s behalf, we can seamlessly upload that sales data into FOCUS CRM. This means time saved extracting and uploading sales data. AGDATA also offers a CRM mobile app that sales reps can easily access out in the field. Pushes additional transactional sales data into the CRM system and pulls CRM data into data warehouse. 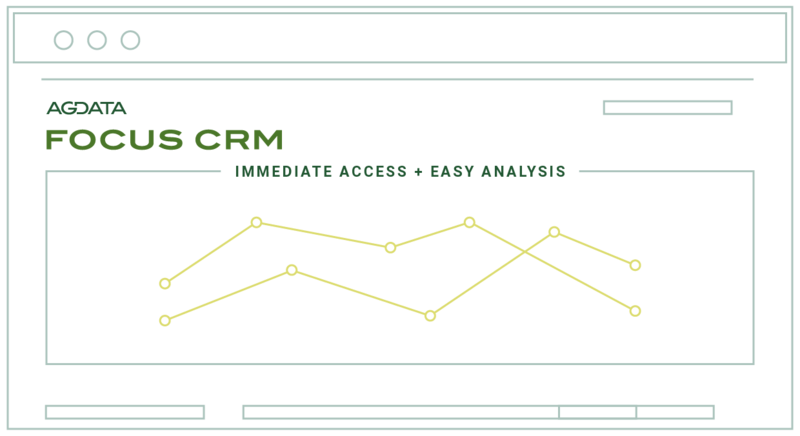 Seamlessly upload sales data into the CRM platform. Populate preferred dashboards or reports from FOCUS ANALYTICS into FOCUS CRM. FOCUS CRM is mobile friendly. © 2018 AGDATA. ALL RIGHTS RESERVED.